Provide comfort for the family of Kay Beres with a meaningful gesture of sympathy. 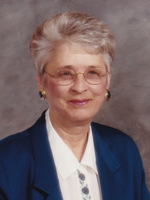 Catherine (Kay) Beres (Sebastian) of Melville passed away Friday, March 15, 2019, at the age of 76 years. Catherine Joan was born on the family farm in the Serath district on September 30, 1942, to Steve and Anne (David) Sebastian. She was the second youngest of 11 children. She passed away peacefully in her sleep Friday, March 15, 2019, at St. Paul Lutheran Home, Melville, SK. Kay attended Serath-Ridge School and completed her Grade 9. In 1959 she moved to Regina with her parents and worked on the second floor (ladies’ wear) of the Army & Navy Department Store. In 1962 she married Oscar Schneider, and in 1964 they moved to the farm five miles west of Melville, where they farmed and raised two children (Darryl 1964 and Starla 1966). They enjoyed travelling, socializing and visiting with neighbours and friends every weekend until 1991, when Oscar passed away. Kay then moved to Melville and in 1997 married Edward Beres. They spent many hours in their motorhome visiting friends, relatives and every rodeo in the province until Ed’s passing in 2010. During her life, Kay worked at various jobs - Department of Highways as caretaker at the Duff Picnic Grounds, caretaker at Zion Lutheran Church and counter attendant at Nellies Bakery; she also cleaned house for many people in Melville. Kay loved gardening, bird watching, travelling, knitting, baking and cooking her world-famous stroganoff meatballs and homemade perogies. She also loved to dance, especially the jive. Kay was predeceased by her parents, Steve and Anne (David) Sebastian; sisters Martha and Anne (in infancy); sister Marcella Linford; brothers Augustine, Max, Steve, Albert and Peter; in-law Clara Sebastian; husband Oscar Schneider and his parents, Henry and Katherine (Litzenberger) Schneider; and husband Edward Beres and his parents, John and Alice (Gulash) Beres. She leaves to mourn her passing her son Darryl (Joy) Schneider and daughter Starla Schneider; grandchildren Amy (Lucas) Thomas, Steven (Emily) Schneider, Holly Schneider (Jon Prudun), Adrian (Tonya) Miller; great-granddaughters, Elyse and Natalie Thomas; her beloved fur baby, Cleo; sister Rose (Barry) Cox; brother George Sebastian; in-laws Dennis and Dianne Schneider, Mervin and Verna Schneider, Irene Sebastian, Lorraine Sebastian, Bernice Sebastian, Wilma Sebastian, Walter Linford, Ray and Lynn Beres, Rita and Peter Hartman, Gladys Beres and Leonard Lutz; as well as numerous cousins, nieces, nephews, friends and neighbours. Kay’s funeral service will be held Saturday, March 23, 2019, at 11:00 a.m. at Zion Lutheran Church, Melville, with interment taking place in St. Henry’s Parish Cemetery, Melville. As per her request, Kay wanted her grandchildren to be her pallbearers: Amy and Lucas Thomas, Adrian and Tonya Miller, Steven and Emily Schneider, Holly Schneider and Jon Prudun. Honorary pallbearers are everyone who knew and loved her. A special thank you to Drs. Eshawash & Van Zyl, the caregivers with Melville Homecare, St. Peter’s Hospital and on Whittmire Lane at St. Paul Lutheran Home. Memorial donations can be made to St. Peter’s Hospital or St. Paul Lutheran Home Foundation. Burial is private for family members. We encourage you to share your most beloved memories of Kay Beres here, so that the family and other loved ones can always see it. You can upload cherished photographs, or share your favorite stories, and can even comment on those shared by others. I’m loving memory of Kay Beres.